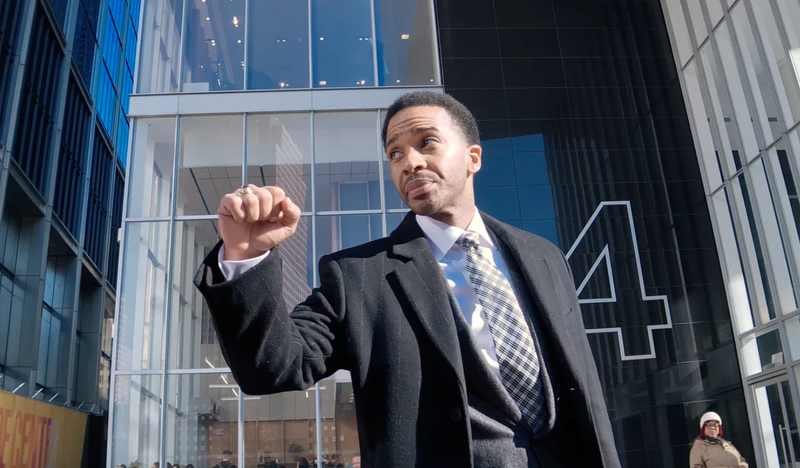 "High Flying Bird" is Netflix's first great original movie of 2019, with a 90% Rotten Tomatoes critic score. Director Steven Soderbergh shot the movie using an iPhone, which he also used for last year's "Unsane." Soderbergh has distanced himself from the Hollywood studio process in recent years, and will likely be working with Netflix for the foreseeable future. Steven Soderbergh - the Oscar-winning director of "Traffic," "Erin Brockovich," "Ocean's 11," and more - has been diving into alternative forms of shooting and distribution with his recent films. And his latest experiment, Netflix's "High Flying Bird," has paid off. The basketball drama, which debuted on Netflix on Friday, is a hit and has a 90% Rotten Tomatoes critics score. The movie stars André Holland ("Moonlight," "Castle Rock") as a sports agent who ventures into a new business opportunity with his rookie client during an NBA lockout. And the movie was shot on an iPhone. Soderbergh also shot last year's "Unsane" with an iPhone, but that was met with less enthusiasm. The Verge wrote that "Unsane" made a "poor showing for the iPhone 7." But for "High Flying Bird," the outlet said Soderbergh improved on the experiment. "Soderbergh shot Unsane in two weeks, and the cheapness of the look felt like part of the movie's grungy aesthetic," The Verge's Keith Phipps wrote. But with "High Flying Bird," Phipps said "Soderbergh has different aesthetic aims, exploring the immersive possibilities of the iPhone's sharply detailed images when shooting in public spaces like restaurants and bars, using its portability to create long walk-and-talk shots, and applying its lightweight feel to intimate close-ups." Other critics also praised Soderbergh's iPhone use in "High Flying Bird." "The iPhone sands away a lot of the cinematic sheen one might get with a bigger, more robust camera, but it can also be put anywhere in a room without taking up much space," The Atlantic's David Sims wrote. "In High Flying Bird, that makes it an ideal device for listening in on conversations between agents, executives, owners, and players during a fictionalized NBA lockout." "Selma" director Ava DuVernay, who has also worked with Netflix, said the movie was "beautifully shot." Soderbergh has distanced himself from the Hollywood studio system in recent years. For 2017's "Logan Lucky," he bypassed traditional Hollywood strategies by raising just $20 million for marketing, a fraction of what a major studio would spend for a summer release, according to The Hollywood Reporter. The movie was a box-office disappointment. In an interview with Filmmaker Magazine in July, Soderbergh said it was difficult to imagine making another movie for a studio. "I'm too frustrated by the way that system works, both economically and creatively," he said. "That's one of the reasons the Panama Papers project will probably end up at Netflix, because it's right in that zone of movies that the studios are not interested in, mid-level budget movies for grown-ups." He was referring to "The Laundromat," a journalism movie about a corporate data leak that revealed how corporations hide their money. "High Flying Bird" beat it to the punch.